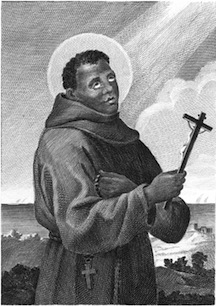 Here is the second Black Saint to be featured during this year’s celebration of Black History Month by my apostolate, and the 2nd installment of Black (And Catholic) Like Me, an article-series that features a Black Catholic saint from history (or soon to be one) and tells a little about him/her and what I believe we can all learn from this godly one about holiness. The idea is simple. Here’s someone who was Black and Catholic, like me. For more info on this article-series and others, visit here. Some of the following is drawn from his Roman-Catholic-Saints.com page (RCS) and his Wikipedia page (Wiki). Benedict had slave parents who were captured in Africa. His parents were purchased and brought to San Fratello near Messina, Sicily and given Italian names. His slave parents worked hard and diligently and won the favor of their owner who later freed them before Benedict was born. Benedict is born sometime in 1526 in San Fratello. He never went to school and started off as an illiterate day laborer at 18 years of age. He was often ridiculed by others for his humble background and for his skin color, but he bore this suffering patiently in a truly dignified and Christian way. The fact that he bore ridicule so well impressed Jerome Lanze who was “a nobleman who had left the world to live under the rule of St Francis of Assisi” (RCS) and leader of a nearby community of independent Franciscan hermits. The community offered him a place in among their ranks. They followed St. Francis’ Rule for hermit life. They were stationed at nearby Monte Pellegrino. He moved to be with them at Monte Pellegrino and was assigned to humble kitchen duties, which he greatly enjoyed. When the leader of the Franciscan hermits died, Benedict was chosen to be the leader of the group. Benedict was again assigned as a cook for the community, but he later displayed great piety. He would go on to serve as novice master and guardian for the community even though he still could neither read nor write. He possessed great holiness and intuitive knowledge of the scriptures and spiritual matters, and others noticed. After many years, Benedict got the chance to return to a humble and quiet life of duties in the kitchen, which was his delight. He died April 4, 1589 at age 63 after a short illness. He predicted the very day and hour he would die. Because of his holy fame while alive, a cultus devoted to his veneration emerged after he died. His body was found incorrupt when his body was exhumed three years later in 1592. Skin color and poor background made fun of and despised. Never given the chance of formal education. Gave back to the community by always helping the poor and accepted visitors; so, he never forgot were he came from and stayed real. There are many Black Catholic parishes in the U.S. named after him. St. Benedict the Moor will be officially placed in the Black Saints page in just a little bit. Also, I will place last Sunday’s holy person, Servant of God Mother Mary Lange, on the page as well even though I do not have a personal reflection for her yet. When I create one I will make it a post and add it to her Black Saint page. 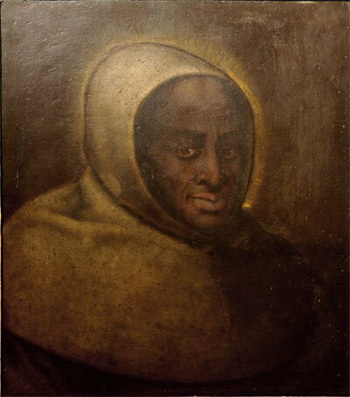 St. Benedict the Moor, O.F.M. St. Benedict the Moor pray for us! Both above pictures I presume are in the public domain because of style. Pic 1 source. Pic 2 source.